Can I set Auto Reply to my Email Account? 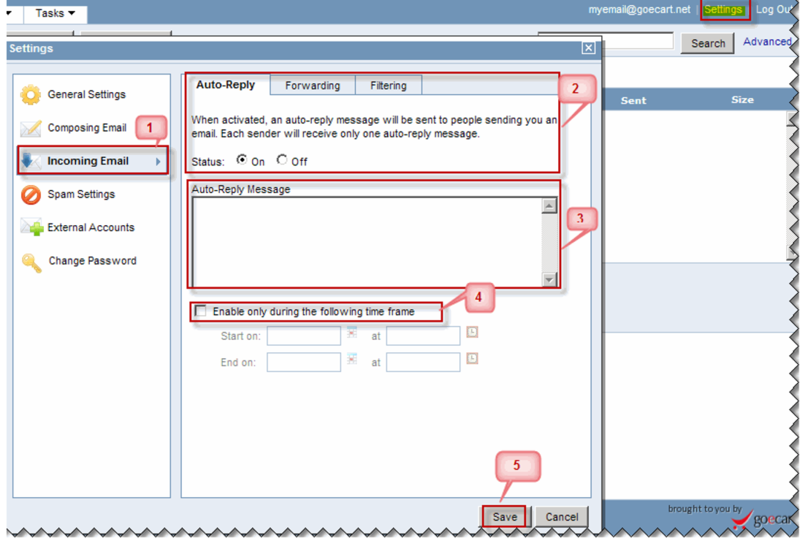 To set Auto Reply, log into your webmail console (https://webmail.GoECart.net), click on the Settings tab in the top navigation, this will open a popup, click on the Incoming Email option. Click on the Incoming Email option in the left navigation. Under the Auto-Reply tab, select the radio button On for Status. Enter the message in the Auto-Reply Message field that you'd like to appear in your auto-reply. If you wish to send an auto reply during particular time frame then select the checkbox Enable only during the following time frame Specify the time zone.